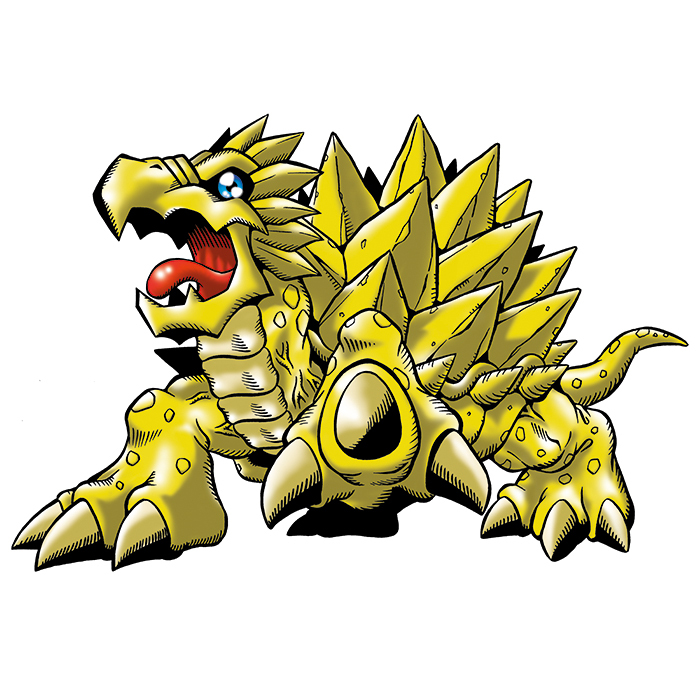 A tortoise-type Digimon armed with a shell from which sharp blades grow. It is heavier than it looks, as both its shell and body have formed to be highly dense, such that it creates fierce tremors with every step it takes. 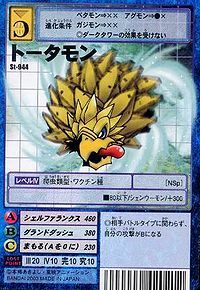 Furthermore, it holds the alias "Noise Digimon" due to its shrill, metallic-sounding cry. While its usual walking movements are extremely slow, it can retract its limbs so that its body is in the shape of a disc and spin itself, allowing it to move at ten times its usual speed. Its Special Move is firing the blades on its shell as if they were multiple-warhead missiles (Shell Phalanx). — Digimon Adventure 02: "Brave Evolution! XV-mon"
Title: 「騒音デジモン」 — "Noise Digimon"
Anime/Manga Digimon Adventure V-Tamer 01: "100% Tamer!!" 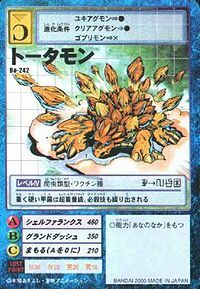 シェルファランクス Sheru Farankusu Strong Carapace Shoots a barrage of rocks from its shell. Kaiten Tai Atari  Spinning Body Blow 回転たいあたり N/A Spinning Attack Withdraws into its shell and spins while tackling the foe. 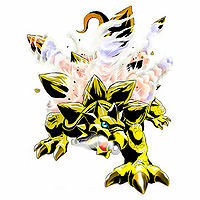 A Tortamon was among the many Digimon seen through the rip in the sky during Vikaralamon's rampage. 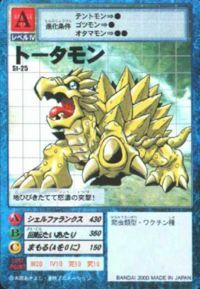 Tortamon appeared at within the city, Daimon Masaru and Agumon successfully reverted it to a Digitama, though not before accidentally destroying a building in the process. 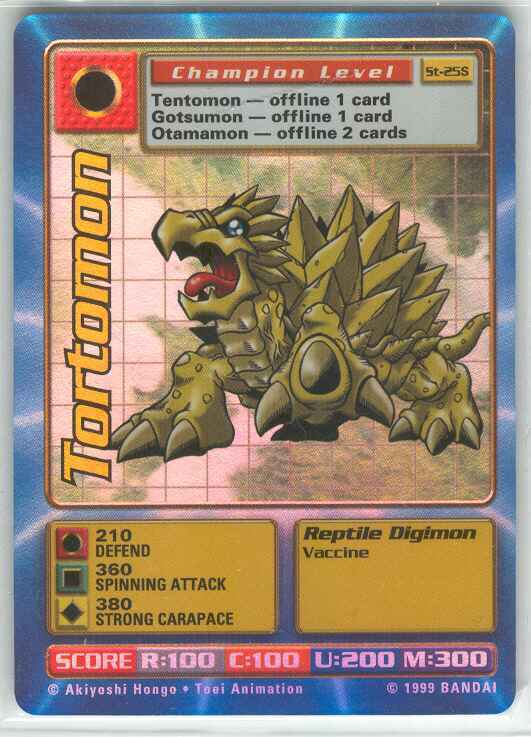 Tortamon is an obtainable Digimon. Evolves from Gomamon (0-2 DP) and can evolve to Zudomon (0+ DP). 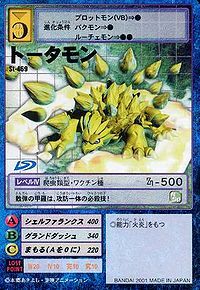 Can be evolved from Kamemon if above level 23 and defense 110, or found at Proxy Island. Can evolve to Brachimon if above level 38, Water EXP 7500, and already had Brachimon in party. Tortamon is a minor enemy Digimon. It can only be obtained as a collectible DigiCard. 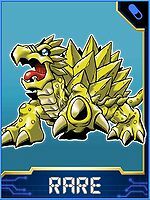 Tortamon is available as a Digimon Medal. Evolves from Tentomon, Gottsumon or Otamamon. 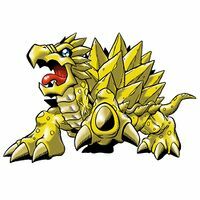 Can evolve to Atlur Kabuterimon (Blue) or be Jogressed with a compatible Digimon to get Jyagamon or Piccolomon. 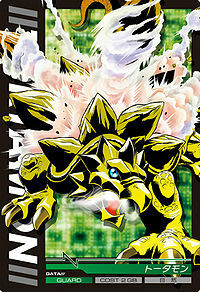 Evolves from Tentomon and can evolve to Jyagamon. Its roaring attack shakes the earth! Its shell shooting technique serves as both offense and defense! Its hard, heavy shell is of super-heavyweight class, and is also used in its special technique. It possesses a highly dense shell with sharp blades protruding from it, and causes a din with every step it takes. Although its movement speed is excruciatingly slow, by retracting its limbs into its body and spinning, it is able to move at 10 times or more of its usual speed. This page was last modified on 2 March 2019, at 21:27.